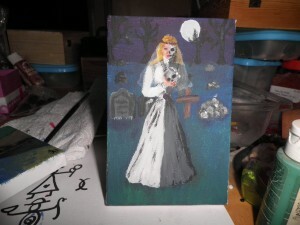 When brainstorming about various altar items I could make for the shop, I thought of small paintings. So I did a couple of them, one of Eshu for me, and one for Maman Brigitte for a friend whose life she saved. They’re about 15×15 cm. and though I decided not to sell them in the shop, you may commission one if you like. Contact me for details. 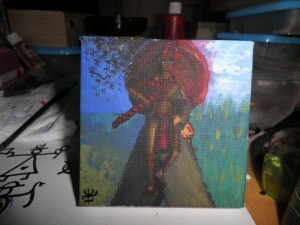 acrylic, art, brigid, canvas, eshu, esu, lwa, maman brigitte, painting, vodou, vodun, voodoo. Bookmark.